You want a smile makeover. You want teeth that are flawless, like a celebrity’s. What you don’t want is an invasive cosmetic dentistry treatment. Cerinate Lumineers, also known as no-prep veneers, can make these wishes come true under the practiced hand of Dr. Michael J. Wei, New York City cosmetic dentist. Cerinate Lumineers are versatile. They can correct multiple problems at one time. That means you make one long-lasting investment in your teeth. While a smile makeover can involve several cosmetic and restorative dentistry treatments, it’s worth considering one all-encompassing correction instead. You can save yourself time and expense with no-prep veneers. Porcelain veneers and porcelain no-prep veneers offer the same amazing smile makeover results, but the composition of, preparation for, and application of both cosmetic dentistry procedures differ dramatically. Composition. As thin as porcelain veneers are, Lumineers are made of an even thinner porcelain material that is digitally designed to be ultra-thin (like a contact lens). Tooth structure preservation. Lumineers require zero to very little tooth reduction. The thin composition of Lumineers eliminates the need for tooth enamel to be drilled down drastically when prepping your teeth for the procedure (only about 0.1mm to 0.2mm of tooth enamel needs to be removed). Veneers require the sanding and shaving down of tooth enamel (0.5mm to 0.75mm) to make room for the thicker veneer. Local anesthesia. Shots and anesthesia are needed to minimize any sensitivity or discomfort when teeth are being prepped for porcelain veneers. The minimal prep of Lumineers typically eliminates the need for local anesthesia. Temporaries. Porcelain veneer preparation does change the appearance of your teeth. While you wait for your customized veneers to be developed, temporary veneers will need to be fitted and worn for about two weeks. The minimal prep for Lumineers means you can wait for your customized veneers to be created without needing to wear temporaries. Application. Lumineers are painless to place on the teeth and the procedure can be done quickly. Because the need for drilling of the tooth structure is eliminated, so is the need for injections. Both veneers and Lumineers are bonded permanently to your natural teeth for a secure smile makeover. Reversibility. If you decide that you no longer want Lumineers on your teeth, or if you do not like how the Lumineers look, the procedure is reversible. There is minimal damage to the nerve of the tooth. Aesthetic results. Veneers and Lumineers are both designed to perfect your teeth and create a flawless smile. However, when Lumineers are added to the front surface of the tooth – no matter how thin they are – they may appear chunkier, thicker, and bulkier. Though the minimal prep for Lumineers is appealing, the aesthetic result of more-invasive porcelain veneers may be far more satisfying. 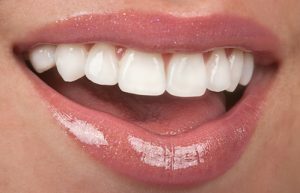 There are advantages and disadvantages to both Lumineers and veneers. Every patient who is interested in these cosmetic dentistry solutions must determine what dental changes they can and cannot live with. Ultimately, both smile makeovers will be life-changing, in a good way. A brand new smile can make you look healthier, happier, younger, and smarter. The most important step to qualify as a Lumineers candidate is to have a thorough examination conducted by your Midtown Manhattan cosmetic dentist. The current condition of your teeth, especially your bite, will be a major factor. The existing color of your teeth is also a critical element. Due to the thinness of Lumineers, the color change of your teeth will be limited and the Lumineers may not look as natural as porcelain veneers. Make no mistake, your teeth will be white, but they will be more opaque white. Veneers are more translucent and reflect light like natural teeth. Ultimately, scheduling an appointment for a consultation and full-evaluation means you will get the information you need about the pros, cons, risks, benefits, and costs of your cosmetic dentistry treatment before getting started with Lumineers or porcelain veneers. Dr. Wei will help guide you to the right procedure for your smile makeover.